The Walt Disney Company announced plans this week to open new 14-acre Star Wars-themed extensions to both Disneyland and Disney World theme parks by 2019. Disney chairman and CEO Bob Iger announced the new timeline via a quarterly earnings call. Disney has also released a series of artists renderings for the theme parks, showing stylized views of a mountainous, forested planet with many of the images depicting the Millennium Falcon spaceship. The theme park worlds are being designed in the manner of a remote, intergalactic trading post, according to the company. The parks will be set on a “never-before-seen planet—a remote trading port and one of the last stops before wild space—where Star Wars characters and their stories come to life,” by a representative on the Disney Parks blog. Disney began construction on Disneyland’s Star Wars-themed expansion in April of 2016. The project, announced with a $1 billion budget, has also spurred a slew of upscale developments in the Anaheim Resort District (ARD), a 1,100-acre, purpose-built hotel and entertainment area in downtown Anaheim. The area sits between the city’s convention center and the Disney theme parks and caters to both groups with increasingly high-end accommodations. Controversy has erupted in the area in recent months as luxury hotel developers have rushed to build new high-end units—using taxpayer subsidies—in anticipation of the new Star Wars theme park. Taken together, an expected 2,380 luxury hotel rooms are on the way across a variety of developments. 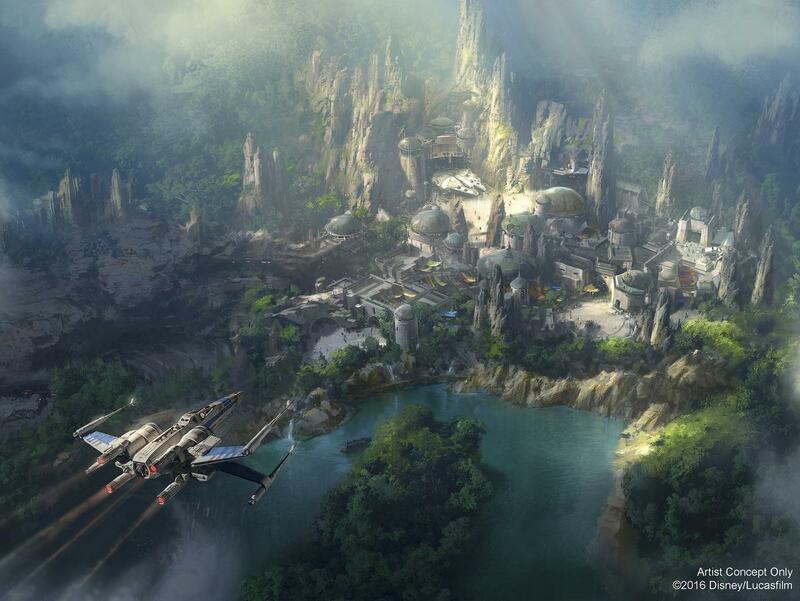 Disney is planning to build its own 700-room hotel to overlook the new Star Wars theme park. A pair of 580-room developments by Wincome Group is also on the way. One, a 580-room complex, will be located adjacent to Disney’s California Adventure park while the second hotel will sit across from the convention center. That second project will contain an additional 40,000 square feet of meeting space. JW Marriott hotels also has a 466-room hotel planned for the area. The Wincome and Disney developments alone will receive a combined $550 billion in taxpayer subsidies; subsidy estimates on the Marriott property are not readily available. The subsidies come in the form of tax breaks, which could allow the hotel operators to keep as much as 90 percent of the taxes collected on site, sending only 10 percent back to the municipality. There are fears that the new developments would cannibalize business—and tax revenue—from existing hotels that do not have access to the subsidies. The new Star Wars lands will take over space formerly occupied by portions of Disney’s existing Frontierland and Critter Country grounds and will replace several attractions, including Big Thunder Ranch. Upon completion, the new Star Wars areas will be the largest single-theme expansions each of the respective parks has undergone. MAD principal Ma Yansong also offers his thoughts on the project in a video posted to Vimeo and embedded on the website: “I think the green space, the public park, is a great asset for Chicago and I want our building [to] blend into this environment,” he said in the video. The setting just south of Chicago's downtown Loop district will provide a unique context, Ma said. “You will see the building as a landscape in front of all these modern skyscrapers.” He described the building's form as “very horizontal, undulating, soft surface merging with [the] existing landscape,” and referenced a public atrium that he called an “urban living room.” That room, and much of the building, will reach out to the sky and surrounding landscape, said Ma. “We want to bring this idea of connecting sky and the land to the project. Because all the space around the museum is about where you touch the land. So the land is very important to us.” The “floating” disc atop the building will feature an observation deck, offering 360-degree views of the surrounding area, including Lake Michigan. Studio Gang “will design the landscape and create a bridge to connect The Lucas Museum to Northerly Island,” according to the project's website. Northerly Island is currently the subject of a massive makeover by Gang that aims to turn the southern portion of the 91-acre peninsula into an ecological park. The website says a live webcam will broadcast the project's construction. The museum's fanciful design is unlikely to cool tensions with the group Friends of the Parks, who have challenged the museum development under Chicago's 1973 Lakefront Protection Ordinance. A formal presentation to the city's plan commission and council is expected next year, but opposition to this private development of lakefront land is likely to continue—especially now that it has a face. A short time from now in a neighborhood not far, far away… filmmaker extraordinaire George Lucas may land his art and film museum in Chicago. The move comes after the filmmaker's bid to build the museum in San Francisco fell through last year. Mayor Rahm Emanuel formed a task force last week, directing a dozen civic leaders to scout out, as the Sun-Times summarized, “a site ‘accessible’ to all Chicago neighborhoods that’s large enough to host a museum ‘comparable to other major cultural institutions,’ but does not ‘require taxpayer dollars.’” The task force is co-chaired by businessmen Gillian Darlow and Kurt Summers. 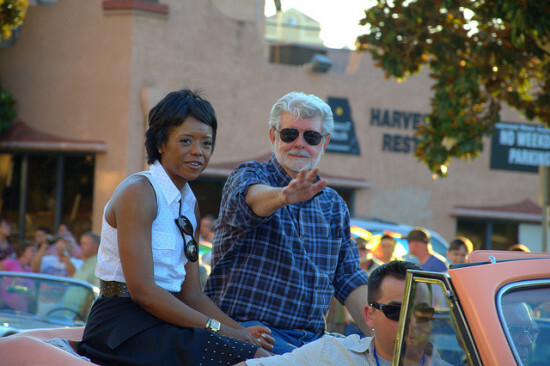 Emanuel gave the group until mid-May to find a homebase for the Star Wars creator, who last year married Mellody Hobson, president of the Chicago investment firm Ariel. Lucas now lives in Chicago part-time, but Lucasfilm Ltd. and special effects company Industrial Light & Magic are still based in the San Francisco Bay Area. Lucas had originally scoped out a spot in the Presidio, but was rejected by the Presidio trust—the nonprofit that oversees the federally owned land at the southern end of the Golden Gate Bridge. Lucas' was one of three proposals for The Presidio's 8-acre mid-Crissy Field site, all of which The Presidio Trust rejected earlier this year, saying in a statement "We simply do not believe any of the projects were right for this location." Spokesman David Perry has described the 95,000-square-foot museum as the “history of storytelling” and the “world’s foremost museum dedicated to the power of the visual image.” Chicago is home to many museums, both well-known like the Art Institute and the Field Museum, and a bit more odd—say, the International Museum of Surgical Science. 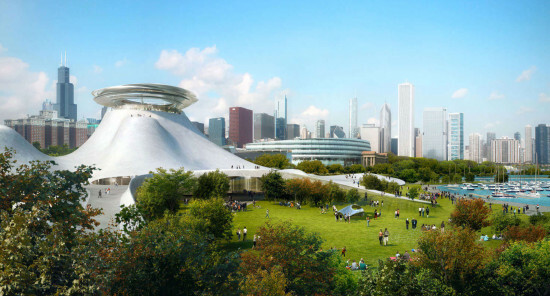 But the Lucas museum, which will include film memorabilia as well as works of art from the likes of Norman Rockwell and Maxfield Parrish, would be a big get. San Francisco is still vying for the return of its film Jedi, but we’ll see in one month how Rahm’s empire might strike back. A software developer gets a subtly intergalactic theme for its new San Francisco headquarters. For the Giant Pixel corporation’s new headquarters, Studio O+A evoked the feel of a sophisticated galaxy far, far away in a renovated San Francisco workspace. With the help of Chris French Metal, Nor-Cal Metal Fabricators, and Seaport Stainless, O+A designers Denise Cherry and Primo Orpilla designed an interior environment that invokes themes from the client’s favorite movie, Star Wars, without delivering a set design for the Spaceballs parody. One of the office’s most notable features is an entry canopy constructed from ¼-inch hot rolled steel plate with laser-cut perforations that sets the office theme with a binary translation of the trilogy’s opening crawling text. “The Star Wars theme placed subtly throughout the office was what the client wanted,” Orpilla, who is one of the firm’s co-founders, said. “With the screen, they also found a way to vet job applicants and collaborators.” Doubling as a puzzle for visitors to the office, the software development company’s founders built an application that converted the film’s opening text crawl into binary code that could be visually translated for fabrication. According to Cherry, the ones and zeros from Giant Pixel’s software were translated to a computer punch code series. In an AI file, letters represented by zeros are punched out, and letters translated to ones were left solid, which was then exported to a DXF that fed the cutting machine. Each panel measures three feet by eight feet, so the character text fits well across most sections, though the blocking bleeds words across lines in a few places. The canopy had to be framed for stability, so Chris French Metal fabricated a from cold rolled steel flat bar and mechanically attached the canopy panels, said Jamie Darnell, project manager and designer for Chris French Metal. For the vertical portion, flush socket cap screws affix the frame to the floor. For the canopy, threaded rod and custom hanger clips suspend five panels from the rafters. To expedite installation, a tooth-like detail locks the panels together and aligns the edges. Less than one year after completing the interiors, an update to the storefront called for a variation on the pixelated theme from the interior. Within the brick and stucco façade, three openings were filled with an oversized version of the binary code that reads as a direct interpretation of the Giant Pixel brand. Eight-and-a-half-inch apertures—filled with tempered single-pane glass and sealed with VHB tape and black silicone—are bookended by two custom pivot doors weighing 800 pounds each. “We push to get in early on projects with the hope of developing collaborative relationships with the designers,” explained Darnell. “It’s more fun that way and the process and end product are usually more interesting in a collaboration than in a traditional design-bid-build process." This story appears to have it all: architecture, LEGOs, Star Wars, and controversy. The Telegraph reports that the Turkish Cultural Community of Austria (TCCA) has taken offense at LEGO's latest miniature plastic toy, a replica of Jabba the Hutt's Palace from the Star Wars trilogy. While some are calling the absurdity of the move a spoof, the group alleges the model is based on the architecture of Istanbul's Hagia Sofia and the Jami al-Kabir Mosque in Beirut, and fills the two revered symbols of the Islamic world with armed criminals. Jabba the Hutt is the slug-like alien and crime boss who maintained a mixed-relationship with smuggler-turned-hero Han Solo, at one point cryogenically freezing Solo. According to the Telegraph, the TCCA said on its website (in German), "It is clear that the ugly figure of Jabba and the whole scene smacks of racial prejudice and vulgar insinuations against Asians and Orientals as people with deceitful and criminal personalities." It has called on LEGO to apologize for the creating negative views of their culture and is considering legal action. 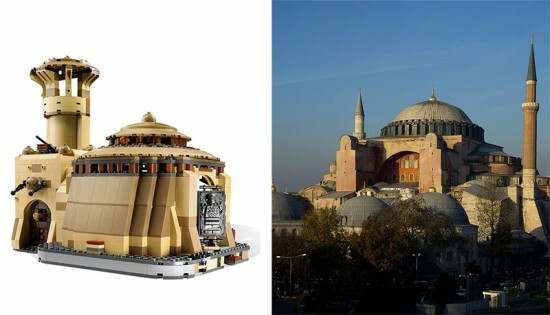 A spokesperson for LEGO denies any link between Jabba's Palace and the Hagia Sofia. Yesterday, New York real estate blog Curbed picked up a rather nerdy feature in the UK-based Architect's Journal: their top ten list of the most important buildings from Star Wars. In addition to judging each project by aesthetic and programmatic merit, the journal draws parallels between the architecture of that galaxy and that of earth. Notables include the Cloud City of Bespin ("a well-appointed luxury resort... complete with hotels and casinos"), the Bright Tree Village on Endor ("rated BREEAM Excellent, the development—by architect Wicket W Warrick—makes use of locally sourced materials, is carbon neutral, and far exceeds Endor's notoriously strict building regulations"), and Jabba the Hutt's palace on Tatooine ("originally built as a monastery by the B'omarr Monks"). 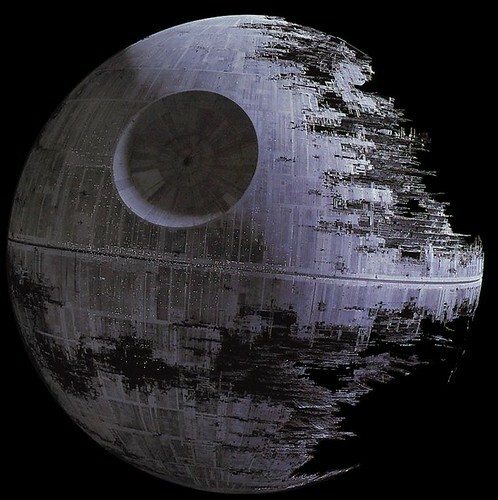 The "run-away winner" however is the second Death Star ("a menacing spherical chunk of Brutalist infrastructure").